This breakfast bowl recipe is meant for days when you have an abundance of fresh veggies. A delicious garlic & herb yogurt sauce ties it all together. This post is in partnership with KitchenAid®. Lately, my fridge has been overloaded with vegetables! We’ve been hitting one, if not two, farmers markets each week. After a long winter, I’m still in awe that we’re able to leave the house, enjoy the fresh air, and peruse rows and rows of glorious vegetables. I want to buy them all! It’s hard for me to hold back, even though I’m mindful of what we’ll actually be able to eat in a week. Another thing that’s hard to hold – my heavy veggie bags as Jack runs off to find the nearest cheese sandwich vendor. With all of this great produce, we’ve been eating a ton of vegetables (Jack’s cheese sandwiches aside) and it feels great! This breakfast bowl recipe is essentially a glorified salad for breakfast, but the cumin-spiced “riced” carrots and beets create a substantial grain-like base. 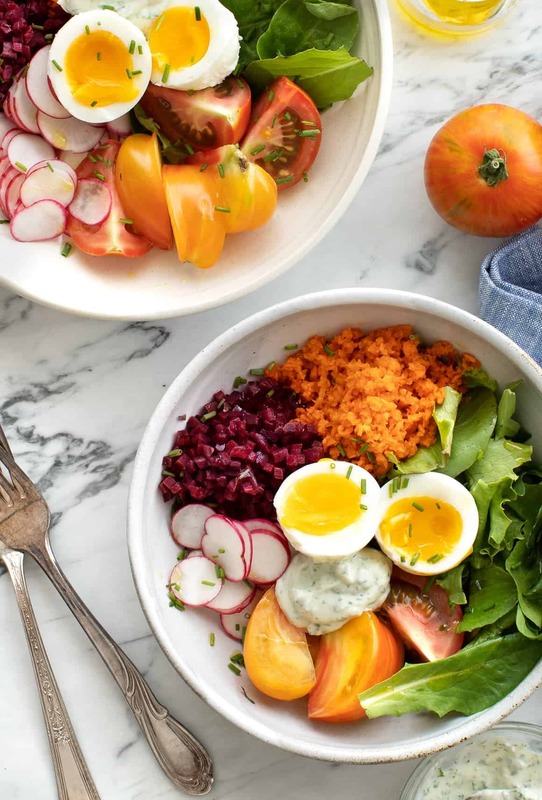 Juicy tomatoes, crisp radishes, and soft boiled eggs are all piled in, followed by a scoop of green goddess sauce to bring this breakfast bowl together. 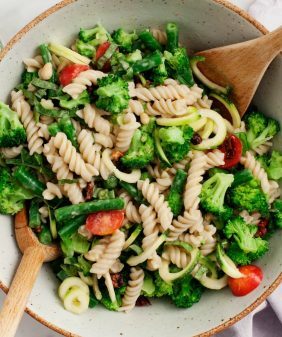 It’s a meal you can feel good about because so many veggies are packed in! About that goddess sauce – it’s creamy, tangy, and full of fresh herbs. So many people always tell me “but I don’t have a food processor! I live in a small apartment!” and I totally hear you. For years, I held off buying a food processor because I was worried about storing it. So my answer is: you have to try the new KitchenAid® 7 Cup Food Processor! It’s the perfect medium size that’s not too big for sauces and pestos, but not too small for falafels and veggie burgers. It can slice, chop, and puree in no time without taking up a ton of counter space. It’s also easy to put together and clean (I put the pieces in my dishwasher). 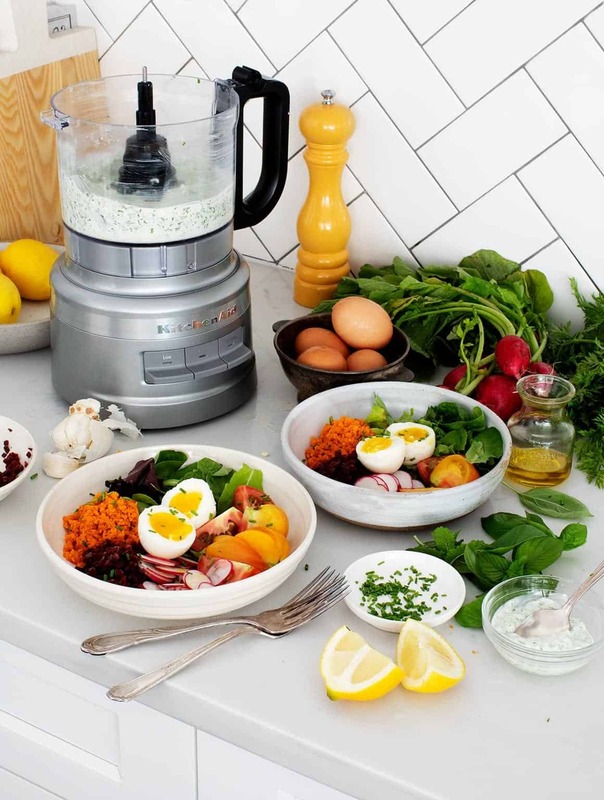 It’s the perfect everyday food processor, in my opinion. For space-saving there is also a cord wrap under the food processor. I love it! 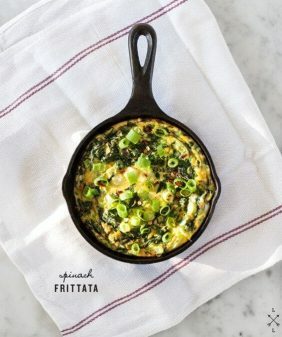 Need more fresh breakfast ideas? 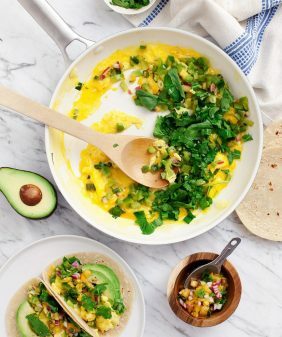 Try this smoothie bowl, this veggie breakfast casserole, or these breakfast tacos! This fresh breakfast bowl has a base of spiced riced veggies, and a delicious herbed yogurt sauce ties it all together. Sub in whatever herbs & veggies you got in your farmers market haul! Make the spiced carrot salad: Grate the carrots (easiest using the grating plate in a food processor). Transfer the carrots to a small bowl and toss with the lemon juice, olive oil, cumin, coriander, and pinches of salt and pepper. Set aside and wipe out your food processor. Make the yogurt green goddess sauce: In the KitchenAid® 7 Cup Food Processor, puree the yogurt, lemon juice, olive oil, garlic, and salt until combined. Add the chives, basil, and mint and pulse until just combined. 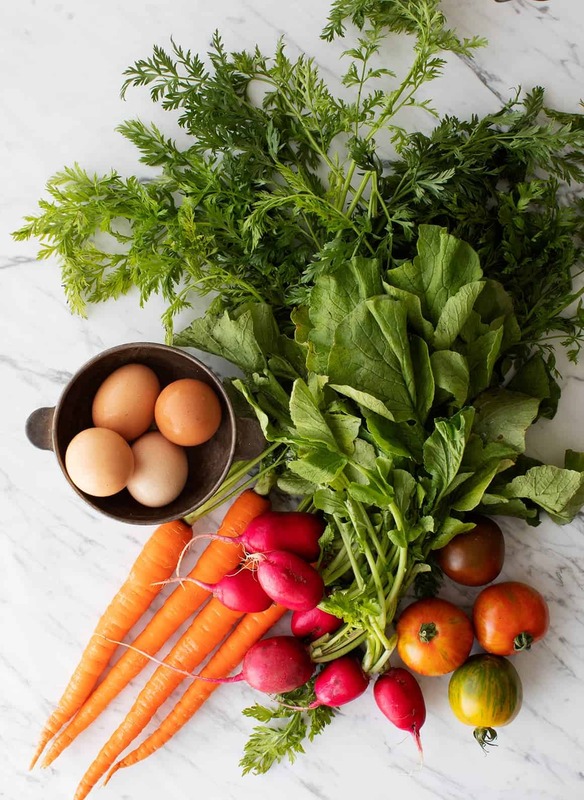 Assemble the bowls with the salad greens, carrots, shredded beet, radishes, tomatoes, and soft-boiled eggs. 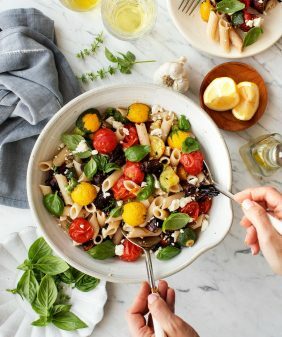 Drizzle the bowls with olive oil and season with salt and pepper. Serve with dollops of the yogurt sauce. Chill remaining yogurt sauce for 3 to 4 days. It’s great for dipping vegetables, spreading on sandwiches, or dolloping onto salads. *To make soft-boiled eggs: Fill a medium pot with water and heat to a gentle simmer, just below boiling. 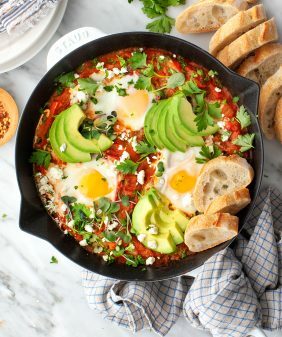 Using a slotted spoon, carefully lower the eggs into the water and let simmer for 7 minutes. Remove and chill immediately in a bowl of ice water for about 3 minutes. Once the eggs are cool, tap the bottom of each egg to crack a little bit of the shell. Take a small spoon and carefully slide it in and around the egg to loosen and remove it from the shell. Set the peeled eggs aside. This post is in partnership with KitchenAid®. Thank you for supporting the sponsors that keep us cooking! Love the serving bowls. Where are they from? Hi Priya, the one that’s more grey is made by Colleen Henessey, the one that’s more off-white is by ANK ceramics. Thanks Jeanine, They are gorgeous. You have just sorted two dilemmas for me this evening . How to make a (quick & fairly easy) healthy breakfast tomoz – and how to help finish all our veg box this week. Many Thanks! Hi Fiona, you’re welcome! I hope you enjoy them! These look delish…but am I the only person who wants this for lunch rather than breakfast???? Not being a meat eater, I eat mountains of vegetables, and even in subzero winter conditions, we still have a slaw or salad at least twice a week , but BREAKFAST!!???? Jeanine, you really must make videos more often! It’s great getting to see a bit of your personality shine through from the video and get a better glimpse how you work in the kitchen! You’re so organized having everything separated into different bowls. I already know my mom will adore the yogurt sauce 😉 I too have been loving going to famers markets. There is something about just walking through stands of fresh veggies and fruit with a basket in hand and the sun shining that brings me so much joy. Is that slightly cliché? Aww, you’re so sweet – we are thinking of doing more video, thanks for letting me know that you liked it!! 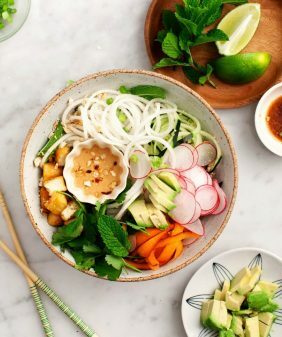 These bowls are seriously full of all the goodies! !